The discovery of Tutankhamun's tomb by Howard Carter in 1922 is one of the most significant archaeological discoveries of all time. It took Carter and his team 10 years to clear the contents of the tomb and among the objects found was a large collection of shoes and sandals. The footwear is analysed here in detail for the first time since the discovery using Carter's records and Harry Burton's excellent photographs along with the author's analyses of the objects, all of which are housed in the Egyptian Museum, Cairo and the Luxor Museum. Several specialists contributed to the volume discussing the different materials (gold, vegetable fibre, birch bark, glass and faience, leather, gemstones) that were used in the footwear. Tutankhamun's footwear is compared with other finds in order to be able to put it in a broader context. 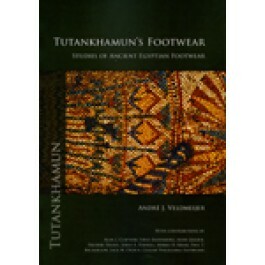 The footwear from the tomb of Yuya and Tjuiu, the King's great-grandparents, are, therefore, analysed as well. In addition to the analysis, footwear in texts and two- and three-dimensional art is considered.